A forced and rapid transition of the Indian economy towards using less cash is likely to result in businesses not paying tax becoming unviable, says a report by Ambit Capital Pvt. Ltd. The government’s demonetization move is being followed up with initiatives to use formal payment channels including digital, and disincentives are being put in place for cash usage. 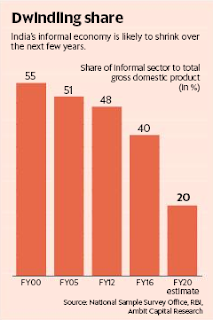 India’s informal economy, which was reliant on cash, may shrink rapidly going ahead. Ambit estimates that its share can fall from 40% as of the third quarter to 20% by fiscal year 2020.